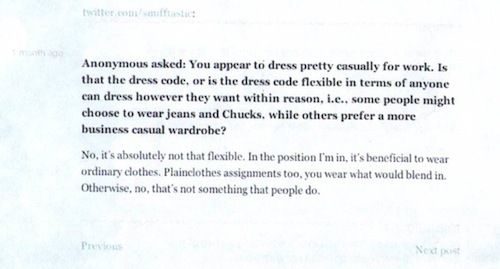 USAS and its lawyers have numerous pieces of evidence placing Rizzi at protests under a pseudonym. 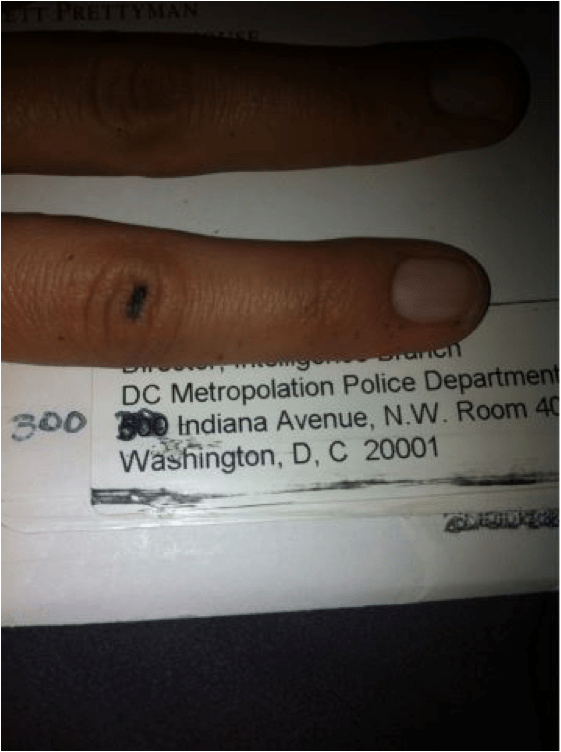 District of Columbia Public Employee Information List records obtained by In These Times confirm that Rizzi has been on the DC Metropolitan Police Department (MPD) force since December of 2003. USAS filed suit on Monday against the District of Columbia seeking an injunction to stop police from spying on the group’s activities. The story of how Rizzi was uncovered reads like a mix of “Gossip Girl” and “The Wire.” Activists pieced her identity together from her obsessive posting to social media sites, including Twitter, Tumblr, Instagram, Facebook, WordPress and Yfrog. Lacy MacAuley, an activist and media manager for the Institute for Policy Studies, has suspected for the past several years that a protester named “Missy” was an undercover cop. “Missy” seemed to be at every protest, but no one knew her. However, MacAuley had no way of proving her suspicions. Then, in November of 2012, MacAuley was at a bar on U Street when a friend recommended that she follow a Twitter account of a funny person with the handle @snufftastic. 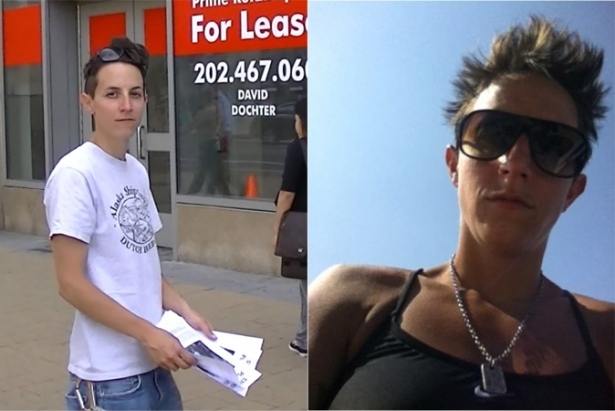 MacAuley immediately identified the user in the photographs as the person she knew as “Missy.” The user Tweeted frequently about the daily grind of being a police officer in DC. MacAuley says she then spotted Rizzi as “Missy” at an anti-Keystone pipeline protest at the Canadian Embassy on March 21, 2013. That was when MacAuley decided to approach Jeffrey Light, an attorney who works on police misconduct issues, with her suspicions. Light and his law partner Sean Canavan began searching for evidence to peg Rizzi as an undercover police officer. Light and Canavan did a public database search of all police officers in D.C. and found only two named Nicole; one was Rizzi. Photos on “Nicole Rizzi”’s Facebook account matched those on the @snufftastic Twitter and Instagram. Light then began searching for a plaintiff who would have standing to file a complaint against Rizzi for spying. On May 15, Light happened to be walking by a USAS protest outside a Children’s Place clothing store in the Columbia Heights neighborhood of D.C. when he spotted Rizzi handing out protest flyers. Light flagged down USAS organizer Garrett Shishido Strain and alerted him to Missy’s presence. Shishido Strain knew just how “Missy” had wound up at the protest: He had met her four days earlier at a USAS protest outside of a Gap. Rizzi identified herself as “Missy Thompson,” gave Shishido Strain her email and phone number, and asked to be informed of future actions so that she could attend. On May 14, Shishido Strain emailed her about a last-minute protest at the Children’s Place in Columbia Heights the next day. Having been alerted by Light, Shishido Strain and other activists filmed Rizzi handing out flyers at the May 15 like a normal protester. Later, Shishido Strain would spot Rizzi once more, at a June 29 protest against the Gap. A law enacted by the D.C. Council in 2004 imposes strict guidelines on police when they investigate or attempt to infiltrate First Amendment-protected groups. The Police Investigations Concerning First Amendment Activities Act of 2004 specifies that the MPD departments can only investigate free speech activities if they can prove sufficient cause that protestors are engaged in crime and they have the authorization of the Executive Director of the DC MPD Intelligence Fusion Divisions (or an appropriate supervisor of similar rank). To send in undercover officers, they have to go through the same authorization process again. But USAS attorneys Sean Canavan and Jeffrey Light say the MPD rarely follows this law. To wit, a 2012 investigation of the department by the Office of the District of Columbia Auditor concluded that the DC police failed to obtain authorization for 16 of 20 investigations into protest groups between January of 2005 and November 21, 2011. (Another seven cases were open during this period, but the files were destroyed before the review.) The report also found that the MPD never obtained official permission to send in undercover officers to protests, but did so in 17 cases. Light, who filed the case on behalf of USAS, says that undercover surveillance sows suspicion among activists and hinders collective action. Shishido Strain says his run-ins with Rizzi have already made him wary of strangers who want to get involved in fights for workers’ rights. Mike Elk is an In These Times Staff Writer and a regular contributor to the labor blog Working In These Times. He can be reached at mike@inthesetimes.com.